Three months of Bible readings to help you investigate the first Easter and meet Samuel and Saul. Find out about Samuel and Saul in 1 Samuel. Look at some of the prayers and songs David wrote - through good times AND bad. Read about what happened to Jesus on the very first Easter in the final part of Mark. And use your XTB Crown Coder to discover who the Real King is. 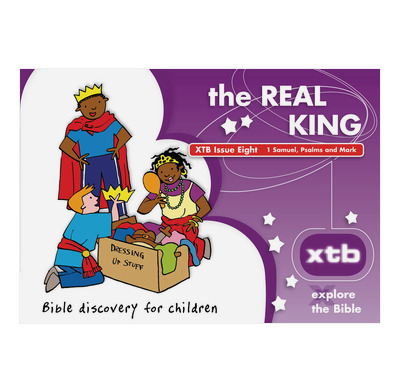 Issue Eight of XTB is called The Real King. Three months of Bible readings to help you investigate the first Easter in the last part of Mark's Gospel, to meet the last of the judges - Samuel - and the first king of Israel - Saul - in the book of 1 Samuel, and to dip into some of King David's psalms as well, plus you get a free XTB Crown Coder...! Back to 1 Samuel on day 46 and you'll get through chs 8-17 by day 65. Hope you have lots of fun with the Crown Coder. It's very cool.